The Amazing Race - The teams make their way to Dresden, Germany via another freakin' train (and plane). Bates the hockey player's bag gets stolen on the train, but he thankfully has his passport which is the only thing that matters. He's also 45lbs lighter which means they'll be even faster. This episode focuses heavily on the country singers and the hockey players relationship. They rely on each other, yet know it's a competition and can't decide when to sever ties. I truly do not care. When they arrive in Germany they hop in Ford product placements and have to answer three trivia questions before they can get their clue and drive away. And we have to watch over and over. Ugh, we get it. The next clue is found at Brandenburg Gate, which sends them to the top of the Park Inn hotel. Both teammates have to base fly from the top of the 37 story building to the ground, which is pretty cool. They follow up this excitement with a Detour to set up a model train set or carry two big light up letters to the Museum of Letters. Thrills!! One of the hockey players breaks their giant V while asking for directions, so they switch Detours instead of starting over. Afterwards, after Phil calls Berlin "the hippest city in the world," the teams complete a Roadblock to search a labyrinth clue maze. It's a bizarre underground club that's borderline haunted/weirdo/freakshow house. Most hate it but Joey loves it and demands him and Meghan return to Germany one day to experience it together. Max and Katie are far ahead of the other teams and check-in as team #1, winning a pair of product placement Fords. The hockey players are in last place and need a miracle to stick around, which translates to the roller derby moms getting incredibly lost. Both search the maze together and head off on a race to the Pit Stop. The hockey players follow the derby moms and easily defeat them in a foot race. 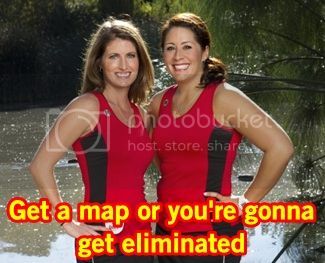 But it's a non-elimination leg (again) so the roller derby moms are still in it. Survivor: Caramoan - Everyone is exhausted from the amazing, mind boggling of Tribal Council. Erik feels he's in a great position able to side with either the bros or favorites whenever he feels. Brenda cries over losing control of the game... you still have six people. STFU. Tree mail arrives with nine envelopes filled with cash: AUCTION TIME!! Immediately Malcolm gets beer, peanuts and pretzels for $20 eventhough he insisted he'd only spend on a game advantage. Reynold wins his bid but then gets choices under tents #2 and #3, but sticks with #1 and gets one slice of pizza (the rest of the pizza was hidden elsewhere and Sherri buys it all for $500). Dawn gets herself a whole roasted chicken for her entire bank. 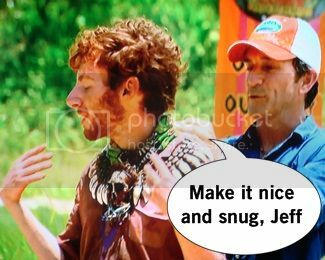 Malcolm luckily gets a game advantage for his remaining $480 and gets directions to a hidden immunity idol. Andrea gets a big bowl of pasta, garlic bread and wine but gives it up to get the tribe new beans and rice (to pee on). Brenda has this depressing attitude about bidding, which allows Cochran to outbid her for an immunity challenge advantage. She ends up bidding $300 and gets pig brain which goes to show her hesitance was warranted. Anyone with $20 can get a letter from home, which makes Dawn and Sherri cry because they blew their money on grub. Eddie wins a mystery item with a twist, which is a bowl of peanut butter for everyone to share. Brenda, dip the pig's brain in the peanut butter for a treat! The auction wraps up with the group messily licking peanut butter from their fingers and hands. And wiping it on their faces... OK.
Everyone returns to camp, smearing more peanut butter on their faces before weeping over letters from home. The gaming starts up when Reynold and Malcolm approach Sherri to join their side along with Erik. "If you don't beat them, you join 'em," Sherri says of the unstoppable bros. Malcolm sneaks into the woods in the darkness of the night trying to find the actually-hard-to-find immunity idol. I know it's buried, not in a tree hole! Andrea idol-blocks, refusing to leave Malcolm's side until the point that both leave together. The immunity challenge this week is to hold a rope connected to a log, moving the rope lower to make the weight harder to bear. Cochran's advantage from his auction prize is that at any time in the challenge he can move his rope up two knots. Cochran takes his advantage after everyone drops two knots, so his will be less torturous than the others. Brenda drops first, followed by Erik. After getting past the last knot there's only bitty pieces of rope to hold, but Cochran is going strong with two knots higher to keep him lasting. The remaining three are Cochran, Reynold and Eddie and Eddie pre-challenge assumed he'd beat Cochran because Cochran's a nerd. Eddie's hands get all slippery and a blurred mouth for curse words later, Cochran wins a physical immunity challenge. 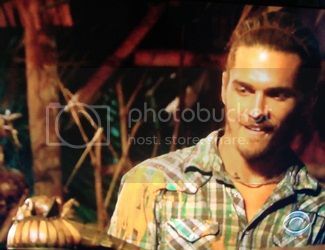 And he's the top immunity winner thus far. Well I'll be damned. The bros are nervous without immunity and no hidden immunity idol thanks to Andrea's hovering. They need to pretend they have an idol and get the six to split the vote. Malcolm works Sherri to get her on his side, casually mentioning they'll need to split the vote because he has an idol and he'll go to the end with her. Erik tells Reynold if it's supposed to be 3-3 he'll vote with the bros. Erik loves playing both sides, but it's a day of reckoning for him as he has to choose a side. Andrea suggests the women vote Malcolm, guys Reynold, and if an idol is played one of them goes. But Sherri is the one they need to worry about because she's ready to play the game. Tribal time! Dumb Reynold says he doesn't see the tribe as six vs. three anymore, because he's a ding-dong. Andrea says anyone flipping will doom their game, especially because the bros are great at challenges (no, Cochran is they remind us). Everyone sort of forgets about Sherri who feels like being the only fan in a favorites alliance makes her the bottom. The topic is brought up that someone could flip and make the bro trio a foursome and change the game. The votes are tallied and no immunity idol is played, so the votes comes out of the barrel. It's a three-way tie between Reynold, Malcolm and Andrea which means a re-vote happens and Reynold, Malcolm and Andrea can't vote. Holy shizz. And it happens: Malcolm's torch is snuffed and my pre-show prediction fails again.